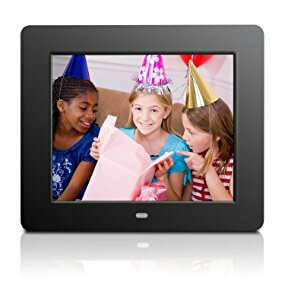 A “Digital Photo Frame” is something that will come in handy when you have too many memorable photos, but not enough space to display all of them. You can enjoy a lot of pictures with just a small space, and some products can even play sounds or videos. There are too many products to choose from, and it can be a bit confusing to choose one. 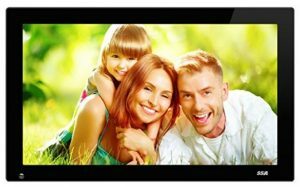 We will introduce to you the most recommended digital photo frames in rank order. Hope you can find the perfect product for you, and display your favorite memories with ease and in style! If you check the descriptions of digital photo frames, you will see terms like screen size, image quality, file type. For sure there are also people who are unfamiliar with those terms, right? 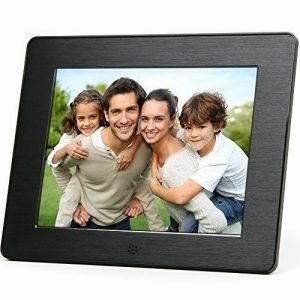 We will first explain them all here, and also the points that you need to check when purchasing digital photo frames. Frame size is the most important thing when checking digital photo frames. The most common size is 7 to 8 inches, but there are also bigger sizes that are more than 15 inches. Check the position and room where you want to place the photo frame, and choose the best size for that place. If you plan to put it on top of your desk, 7 inches or smaller can be enough since you’re in a close distance, but if you plan to put it somewhere that you won’t be able to look closely, then we recommend frames that are 8 inches or bigger. You would also want to check the aspect ratio. The two most common aspect ratios are 4:3 and 16:9, and if you plan to display pictures that are taken with compact digital cameras, choose 4:3 ratio for better fit, and for pictures taken with DSLR, choose 16:9 ratio since it is closer to 3:2 ratio for better fit. The recently released digital photo frames are mostly 16:9, but there are products with adjustable aspect ratio, so try to look into that as well when choosing. 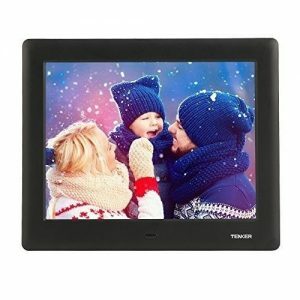 It will be a waste if you won’t be able to display beautiful photos on your digital frames. In order to achieve this, you would need to check the pixel resolution. The higher the number that represents its pixel resolution, then the pictures displayed will be more detailed and beautiful, even when you look at it up close. This is very important especially when you are planning to display high-quality photos taken with DSLRs, and the recommended resolution is 800×480 pixels or higher. Products with high pixel resolution usually indicate “High Res” or “HD”, you can just check that too if you find the numbers confusing. 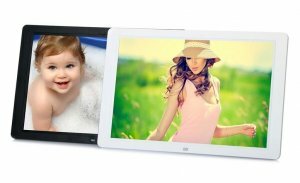 There are digital photo frames that have internal storage, and those without an internal storage. If there is an internal storage, then you don’t need to purchase an external storage like SD card. We would recommend products with internal storage, since the reading process is easier for the product too. In this case, checking the storage capacity is very important. The bigger the storage capacity is, the more pictures you can save. The most common digital photo frame size is 2GB, and this size is basically good enough. Though the cameras continue to develop with the ability to play HD videos, so it is definitely better to choose products with bigger capacity. There are also products with 8GB capacity, try to check them out. Make sure to check the compatible external storage too. A lot of cameras now-a-days use SD cards as its main memory, making most digital photo frames compatible with SD cards. You can insert your camera’s SD card directly to your digital photo frame, getting rid of the troublesome process of transferring your files from your camera to your digital photo frame. 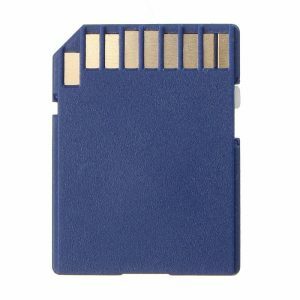 It will be safer to check the compatibility of different types of SD cards, as there are many types and sizes as well. If you plan to display pictures that you edited on your computer, then checking if you can use flash drives will also be important. 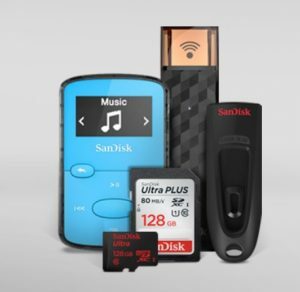 There are also products that are compatible with both SD card and flash drives. There are a lot of products with additional features, like those that can play music, or videos. Below are some of the most common features, you can use this as a reference when choosing what to buy. 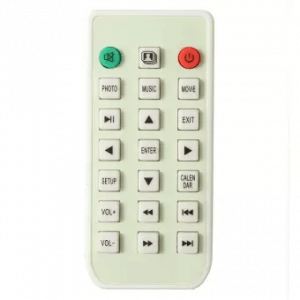 A remote control will come in handy when you want to control your digital photo frame from a far. You can also turn them on or off at any time with more ease. Most products come with a remote control, but double check them before purchase just to be sure. Sorry to keep you waiting! Let us now move on to the top 10 digital photo frames in rank order. Wondering which product wins the number 1 spot? Hope you enjoy the article up to the last paragraph! Though the frame’s TFT display panel won’t wow you with sharpness, this shouldn’t be a surprise considering its price. If you don’t have SD card and if you are keeping your pictures and movies on your PC, there is no reason not including this product on your shopping list because of its large internal storage. This product, unlike the other digital frames on our list, is recommended for those who are looking or large frames that will serve as a digital signage for your business. You can also play videos with its full HD resolution, or just use it as a business signage to display business hours, it can serve as your menu board and many more. You can remotely upload, delete and edit its contents, and it has 50 GB free cloud storage too. It also has social media integration, which enables access to your photos and videos in social media and online storage like Facebook, Google Photo and Dropbox. This product is another inexpensive choice and very easy to use, with no required setup and no software to install, you can just insert a USB flash drive or SD card with photos and MP3 files, then turn it on, and the slideshow will automatically start. That being said, we highly recommend it for the elders or for those who are not very tech savvy. Reviews commended its stylish and classy look despite its low price. It even comes with great transition options. If you’re looking for a budget-friendly gift to your parents or grandparents, this can be a great idea! This product may not have the added features, but it supports a 1024×600 screen along with 720p and partial 1080p HD video playback. This may not have the resolution and quality that far more expensive options have, but if you are looking for a basic frame with a really good price and a very good quality, this product is a solid contender. Its real strength lies in its ease of use, a plug-and-play solution with no software to install. Most users rave about how the resolution automatically adjusts and the sound is fantastic. One of the reviews said the remote has all of the needed features on it and works from across the room. This product has 10.1 inch HD touchscreen which can show clear and bright images from any viewing angle. It has a built-in rechargeable battery and charging stand that lets you take your photos and videos anywhere you go. The most outstanding point of this product is its ability to automatically share photos from your smartphone with Wi-fi. This product may not be the right product if you take your photos with your camera since it does not have an SD card slot and a USB port. However, if you always take pictures and videos with your cell phone, it gives the easiest way to watch them with your family. 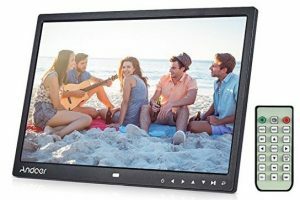 This product has a 21.5 inch full HD widescreen for a truly excellent image experience, with a good storage capacity of 16 GB internal memory, and still expandable via SD card, MP3 player, or other USB ready devices. The best part about it is that it has a motion sensor that can sense movements for up to 2.5 meters and automatically turns on. This feature can help you save on electric bills. 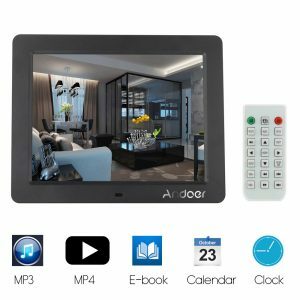 A new age LCD screen that can serve as your company display, or serve as your photo frame in large areas in your house such as your living room to entertain your guests. Highly recommended for those who are looking for a bigger photo frame without spending so much. 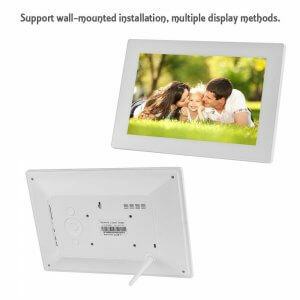 This product is the highest rated digital photo frame in most tech reviews and online market sites because of its hassle-free use and set up while being able to display High-Resolution display. A lot of reviews commended how it detects portrait orientation and automatically adjust accordingly. It also has a motion sensor too so it turns on automatically! This does not have a Wi-Fi function, so we can’t recommend this to those who often use their smartphones to take photos. However, since this does not require you to create an account, we highly recommend this to those who use their cameras to take pictures and want a simple user-friendly product. 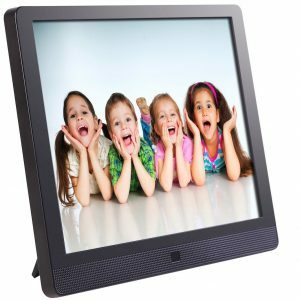 This product has 1280×800 HD resolution that can display good quality photos, and a 15inch frame that is good enough to be viewed from anywhere in the room. Aside from the usual displaying of photos, playing music and videos, you can even use this to read e-books! This can also be a great idea for a wedding or wedding anniversary gift, with a price that is just right, and you can preload the couple’s pictures and display memories with style. This product is a perfect combination of sophisticated design with cutting-edge technology. If you want to add a little elegance and luxury to your home and/or your office, this frame has three gorgeous silk-metal finishes to choose from: Peach Copper, Silver and Burnished Bronze. Reviews commended its ability to automatically adjust the screen brightness, adjusting to the best setting to make each photo look its finest in any lighting and from any viewing angle. 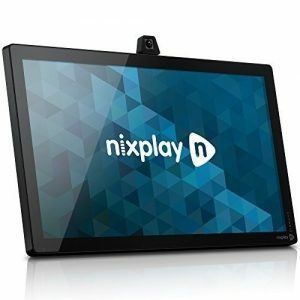 Photos can be shared over Wi-Fi via the Nixplay Mobile App. Each account has 10 GB free cloud storage, giving you plenty of space for all of your digital memories. 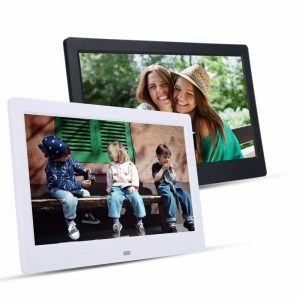 This frame has a variety of connectivity options to share and transfer your photos. 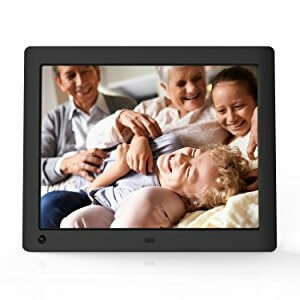 Many users consider this frame as their top pick for a picture perfect gift idea to stay connected with their friends and elderly relatives. It has a simple configuration setup which allows you to remotely manage their frames through Wi-Fi network, or update the frame with pictures from around the world via email. This product has an incredible 4 GB internal memory which can store up to 15,000 pictures, which makes it a great product as a present as well. Many users like being able to pre-load their favorite photos on the frame to give it as a gift. How was the digital photo frame ranking? Were you able to find the product that you want? 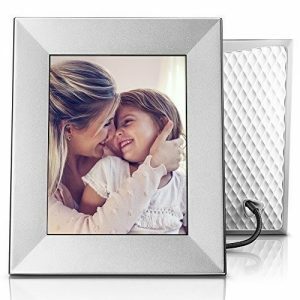 Digital photo frames will allow you to display many pictures without taking too much space, and this can be a great gift to your friends or to yourself! To prevent your purchase becoming a waste because of incompatible external storage, or incompatible size, make sure to keep in mind the pointers that we discussed upon your purchase!